As the 2016 presidential campaign ramps up, Republicans and Democrats have different wish lists when it comes to what traits they want in a candidate. Military service far and away tops the list for Republicans, while a significant share of Democrats would like to see a woman at the top of the ticket, a choice that has much less appeal for the GOP, according to a Pew Research Center survey conducted last month. Republican and Republican leaners respond strongly to military experience: 58% say they would be more likely to support a candidate with military experience, the top positive trait for Republicans of the 16 tested in the survey. Military experience also tops the list for Democrats and Democratic leaners, but they are not as enthusiastic as Republicans: 31% say they would be more likely to support a candidate who has served in the military, while 62% say this wouldn’t matter to them. While a positive for both Democrats and Republicans, military experience is not easy to find among the list of much-talked-about potential 2016 candidates. With Hillary Clinton looming large over the potential Democratic presidential field, 27% of Democrats say they would be more likely to vote for a woman presidential candidate, the third most positive attribute for Democrats. A candidate being a woman ranks highly as a positive trait among just 11% of Republicans. 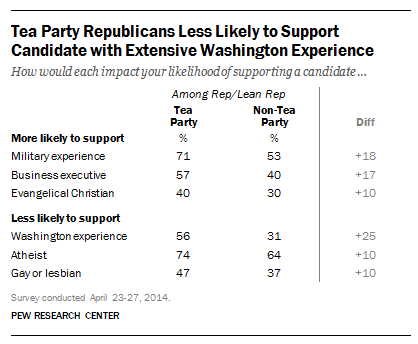 The parties differ in evaluating the value of business experience. For Republicans and Republican leaners, it is the second most popular trait, with 46% saying they would be more likely to support a business executive running for president. The trait does not crack the top five for Democrats and Democratic leaners, with as many who say they would be less likely (20%) as more likely (21%) to back a business candidate. 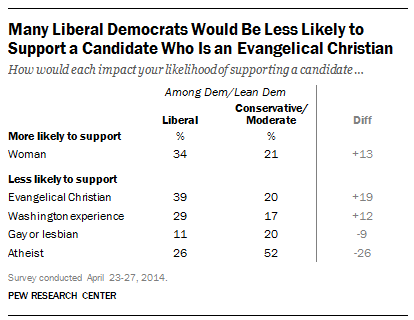 Republicans respond positively to a candidate who is an evangelical Christian: A third say a candidate being an evangelical would increase the likelihood of their support. By contrast, a candidate being an evangelical Christian is a net negative among Democrats with more who say this would decrease (28%) than increase (11%) their support. Underscoring the importance of religion within the GOP, a candidate not believing in God is the top negative trait for Republicans and Republican leaners (67% less likely to support). Democrats also have concerns about an atheist candidate, but that attitude is not as widely shared as it is for the GOP —42% would be less likely to support such a candidate. A gay or lesbian candidate would have trouble winning the Republican nomination: 41% of Republicans and Republican leaners would be less likely to vote for a gay candidate compared with 16% of Democrats and Democratic leaners. Within the Republican Party, those who agree with the Tea Party movement are especially enthusiastic about military and business experience and a candidate who is an evangelical Christian. In addition, most respond negatively to long Washington service: 56% of Tea Party Republicans would be less likely to vote for a candidate who has been an elected official in Washington for many years, compared with 31% of non-Tea Party Republicans. 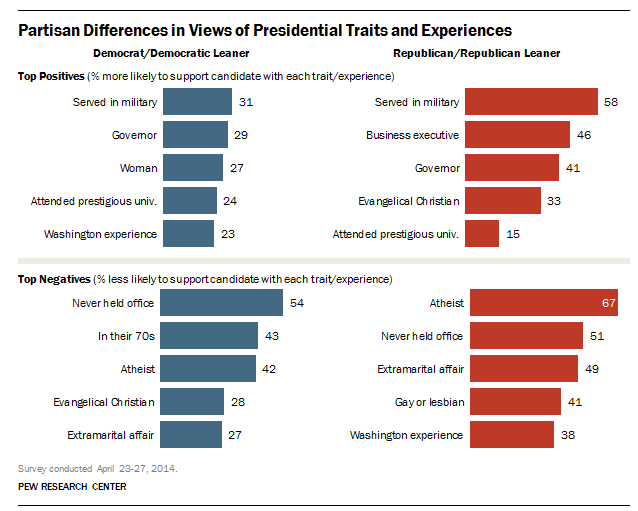 Among the Democrats, liberal Democrats and leaners see a candidate being an evangelical Christian as more of a negative than a candidate who does not believe in God (39% vs 26% less likely to support). The reverse is true among conservative and moderate Democrats: 52% would be less likely to support an atheist, 20% an evangelical Christian. Liberal Democrats are the most likely to say a candidate being a woman would increase their likelihood of support (34%); this compares with 21% of conservative and moderate Democrats.